We finally decided on a paint color after getting 5 samples of different greys. We went with "flannel gray". 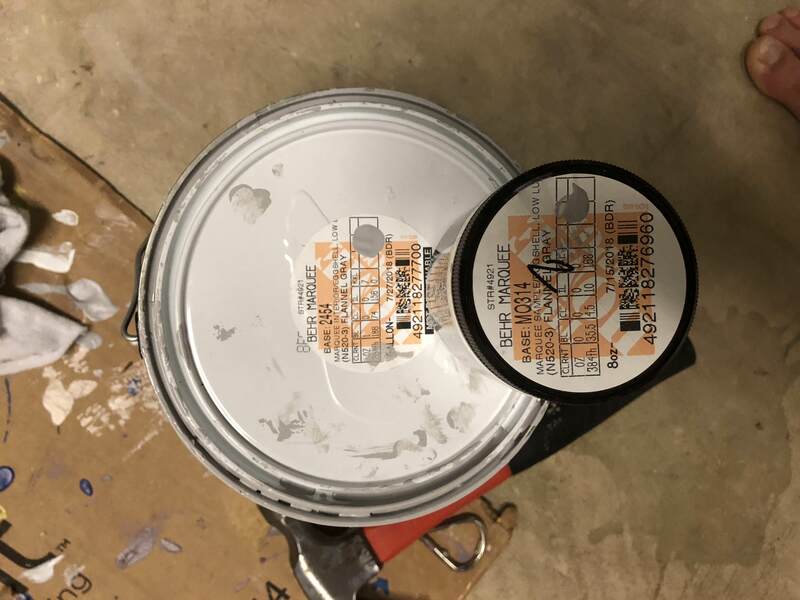 Question I have is both the sample and gallon were made in an eggshell marquee paint but looking at the label each have a different base and different values. We feel the gallon is drying at a different shade (more blueish purple) than sample. We want to know if it's just because of room setup/light now that we've painted two large walls vs small patches as with the sample, or was there errors in mixing of either the sample or the gallon. Any help is appreciated. You actually have the same bases. For whatever reason, the testers were given a different nomenclature than the actual paint cans. MQ314 is the mid-tone base Marquee eggshell, as is 2454. The numbers on the gallon should be approximately 16 times the numbers on the tester, as it is 1/16th of a gallon. First, if the paint appears to be different, make sure that both are thoroughly stirred up. Some colorants take a little longer to dissolve than others. I have often found that when a color is off, a little more shaking would correct the problem. After stirring, stick a paint stick in the wet paints to see if they look the same - they should! Try drying a sample side by side. If they don't look very close, return them to the store to have the problem corrected. Home Depot guarantees satisfaction in such cases. BL is lamb black. Lamp black is where the basic gray tone is coming from. However, straight lamp black goes to a very cold blue/gray. KX is merely additional white pigment to lighten the paint. I hope this cures the problem, or at least gives some light as to what is going on. Feel free to bring it back to HD if additional help is required. HD's corporate policy is of complete satisfaction , up to and including replacing the paint.